Well done, and enormous thanks to you, Yodit. You are an inspiration to us all; not the least your friends at both Derwentwater and Sohm Lower Basic Schools. All the very best to you in your new school, in September. As a result of your efforts, we will be able to get an additional £5 from the British government. That £20 will mean a new set of exercise books, for every one of the Year 6 equivalent pupils in Sohm, as the new school year starts in September. Yodit, Year 6 pupil at Derwentwater School, Acton raises funds for Sohm via a sponsored silence! We hope you have had a chance to look at the video that our good friend Ian Wiggins shot for us in February. It is professionally produced and only six minutes long - so give it a viewing - please. 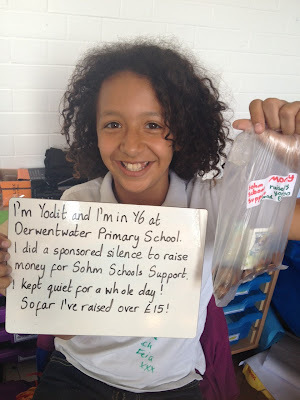 It gives a good insight into what Sohm is like and how the money from our generous sponsors has been spent. It also gives a few ideas on what and future donations could be spent on. We are pleased to announce the prize winners of this summer's raffle. 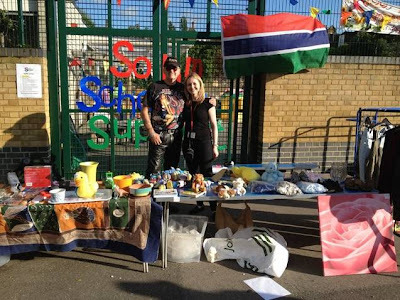 We raised over £300, mainly through the generous contributions of parents, pupils and staff at Derwentwater primary school, after our attendance at their summer fair, early in July. That money should be able to bring back into use a badly damaged classroom, whose broken windows and fragile roof have made it unsafe for use for the last two years. Thanks to one and all. Thanks to you all, and to the other, less lucky ticket purchasers. And, finally ... The winners of the auction for Sadlers Wells Tickets, for their autumn production of Cirque Eloize iD at the Peacock Theatre in October were .... Sandra and John Walker! So, thanks to them for their £50 bid. We'll be in touch soon to tell you how to pick up your tickets! It's a few big thanks from us and a couple of great opportunities for you, this week. Not to mention a couple of mouth-watering teases for the future. So, read on! First, the thanks. To our good friends Barbara and Richard who bid over £200 for the two tickets we were auctioning for the Bruce Springsteen gig in Stratford last week. That was very generous of them, and with the Gift Aid we can claim amounts to almost £300 that can go towards rebuilding a crumbling classroom in the Sohm Lower basic school, next spring. The weather was wonderful, the Boss was fantastic and a great time was had by all 40,000 in the Olympic Park. Can there be a better, more honest, hard rocking, crowd pleasing, totally energising 60 year old around? 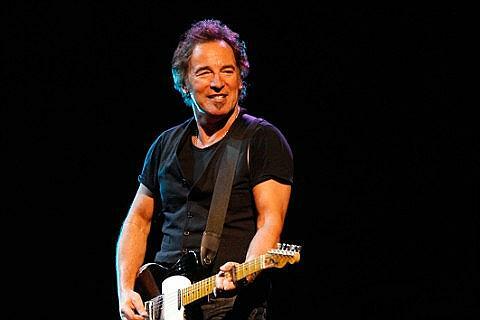 Bruce, that is!! Next - at the other end of the age spectrum, the kids of Derwentwater primary school in Acton. 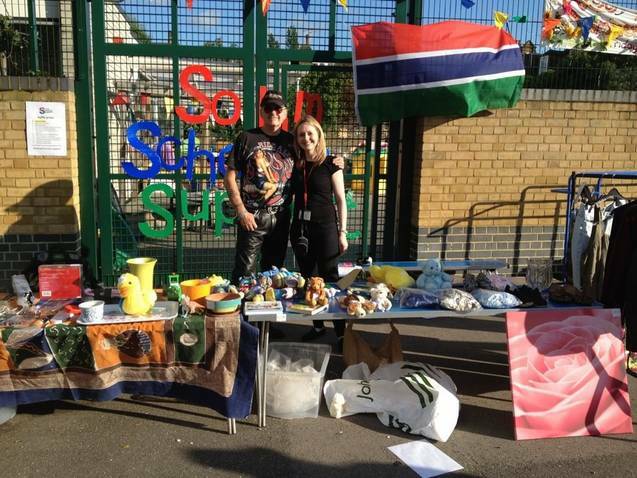 They invited us to their summer fair last Friday, when we were able to recycle last year's unwanted Christmas gifts and raise almot £400 on the day. Pester power is great, the kids nagged their parents, and lo and behold the parents' purses opened and the pounds came tumbling out! So, that little lot, when added to Richard and Barbara's generosity will probably pay for the complete restoration of a classroom. Great stuff. It wasn't just the brik-a-brak, however, Derwentwater pesterpower probably raised £60 as kids old and young alike sat on Biker Bill's Harley and could only imagine the thrill of the open road. At £5 a photo, not bad. So, thanks Bill. That little stash will go towards the Bike Fund that your and Bab's' efforts are keeping going in Sohm. Then, there's the raffle. Probably £100 raised for that on Friday. Results not declared until next week's exciting instalment of this newsletter. So, be ready - keep watching and see who the lucky few will be! A big thanks to our good friend Elin and her employers, Sadler's Wells, for their generosity. They have kindly donated a couple of tickets to us for the exciting Cirque Eloize's iD show at the wonderful Peacock Theatre, just off the Strand, for Tuesday 1 October, this year. 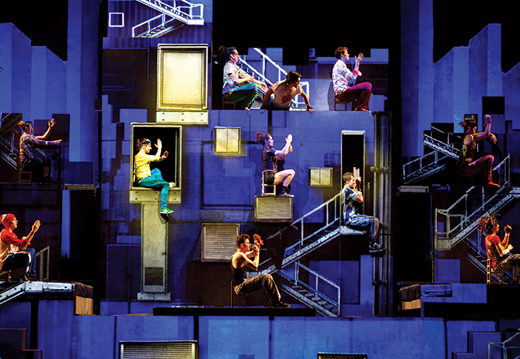 "Award winning contemporary circus company Cirque Éloise have wowed audiences from Broadway to the Sydney Opera house with stunning performances that combine breathtaking circus with dance and music to create highly original shows. Their latest creation, iD is coming to Sadler’s Wells West End venue the Peacock Theatre this October for a limited three week run. Set against an urban backdrop in the heart of the city, iD is a blend of circus arts and street dance accompanied by an original soundtrack that draws on rock and hip hop music, and a talented cast of 14 international performers. “You’re not going to find a more energetic, mind-blowing, roofraising piece of entertainment” Toronto Star"
Wow!! All you need to do to guarantee a pair of £24 plus each seats for this hot show is to make a bid to us, before 21 July, by e.mail, post, phone, carrier pigeon. All monies received can be gift aided up and will be used in Sohm next Spring. So, get bidding, folks! If your pleasures are more sedanatry, you can plan some fab winter evenings huddled around the fire now, playing chess on an exquiste all glass set. Now is your big chance to bid for this super set. We can't promise it will improve your play, but your enjoyment will be enhanced and the pleasure of your game boosted as you fondle the lovely little pieces! We guarantee that every gift-aid topped up pound raised by the best bid for this will be spent on chess and other, similar games for the Sohm youngsters when we are there next year. Bid! boost Gambian play,!and posess an aesthestic delight! Best offer by 21 July gets the set. Go on - you know it makes sense! So, next week it will be the raffle results, but even more exciting - if that is possible - two video clips from the absolutely wonderful Ian Wiggins. Baftas and cannes prizes await these fantatsic productions. Book 10 minutes in your busy diaries to be wowed by earwiggy and Sohm's youngsters au natural - but not till next week!